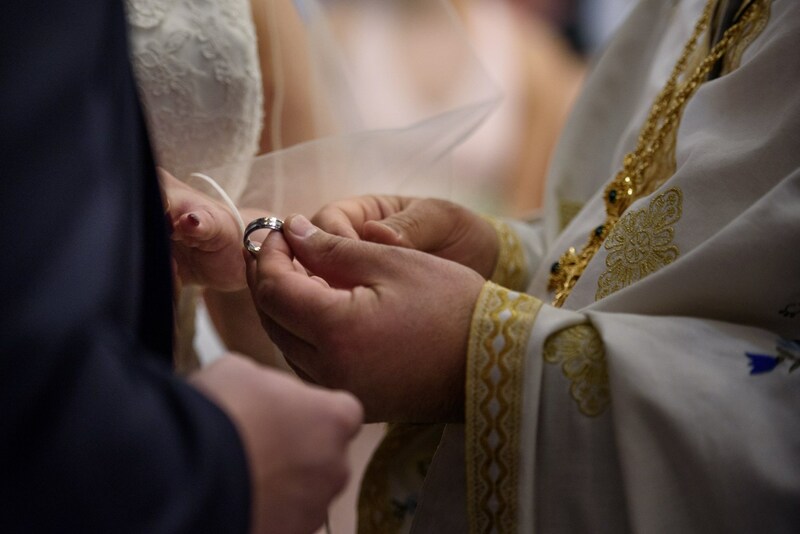 Holy Matrimony is a sacrament of the Orthodox Church in which those desiring to wed agree before Christ, the Priest, and the Church to be loyally united together for life. God’s grace is imparted through this ceremony to help the couple live together, mutually fulfilling and perfecting each other. The Sacrament of Marriage is actually two services in one: first, the Betrothal service and then the Wedding or Crowning service (they are described further below). The Betrothal Service: The couple’s entrance into the church from the narthex, the area closest to the outside world, represents that the relationship which began “in this world” will now move into the church for blessing to enter “the world to come.” At this time the bride and groom each declare their willingness to be married to the other. This part of the service recognizes the civil union through which a man and a woman come with free will to join each other. The priest then gives the bride and groom candles that they will carry throughout the rest of the service as a sign of their willingness to follow Christ and His light. They are acknowledging their desire to have their lives lighted by the teachings of Christ and His Church. During the Betrothal, the Priest prays for the couple to have a life of perfect love together, for salvation, and for the blessing of children from their union. 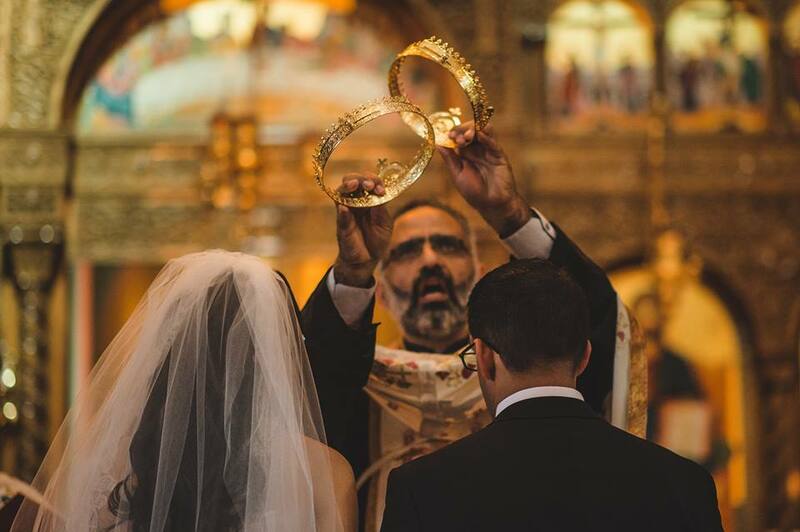 The Priest first blesses the rings and then lifts them above the heads of the bride and groom as he blesses their betrothal three times, in the name of the “Father, and the Son, and the Holy Spirit,” invoking the Holy Trinity. 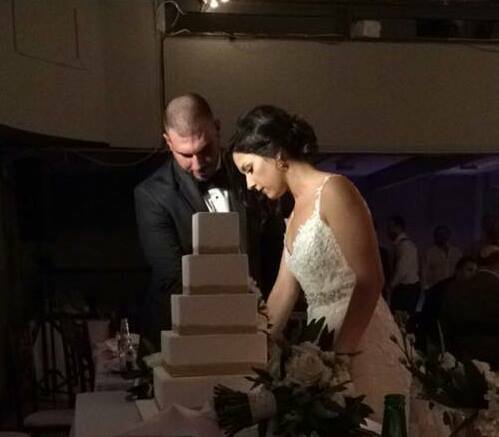 The rings are then exchanged and placed on the ring finger of the right hand of the man and the woman. Promises are made and oaths are taken with the right hand, symbolizing the right hand of God that blesses. Christ ascended to sit at the right hand of the Father. Finally, those who inherit eternal life will go to the right hand of God. 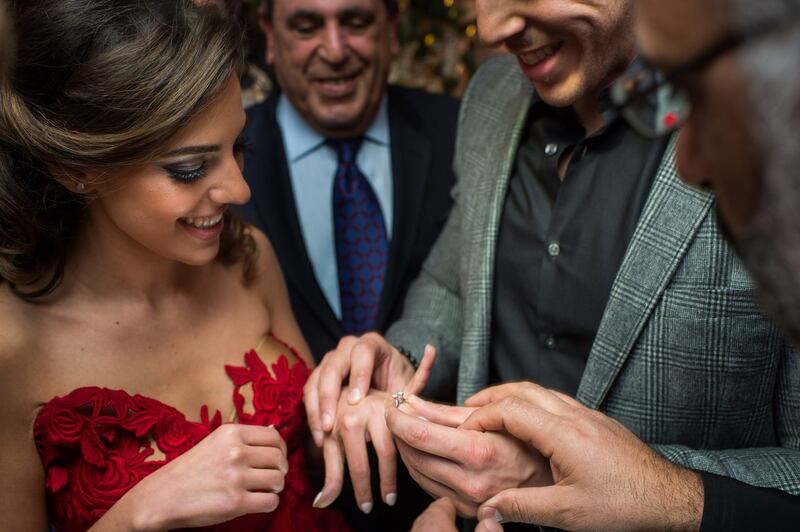 In some Orthodox traditions, the bride and groom exchange the rings to symbolize that they will compensate for each other’s strengths and weaknesses. Only by the union of the two are they made perfect. Wedding service: At the beginning of the Wedding Service, the Priest censes around the table before the altar as he chants Psalm 128, “Blessed are they that fear the Lord, and walk in His ways . . . ” By coming to the altar, the couple offer their lives together to God for His blessing. While offering prayers to “join” the bride and groom to “unite them in one mind and one flesh,” the priest joins their right hands to symbolize their union. The couple holds hands for the rest of the service. 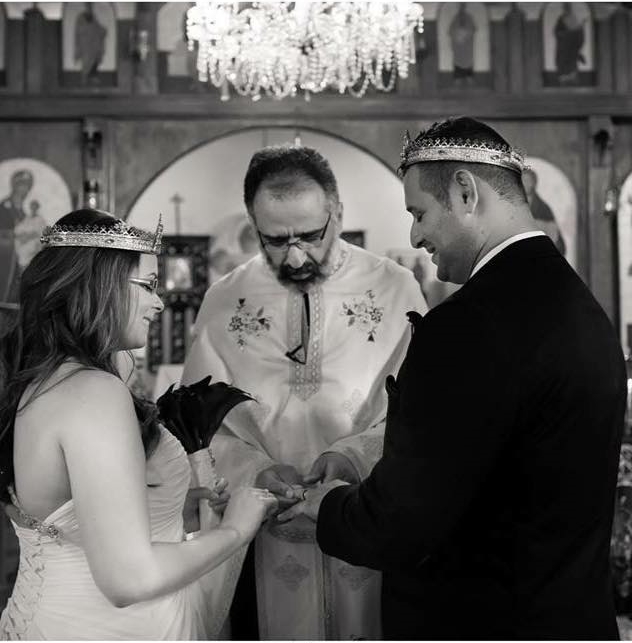 The Priest offers prayers for the couple and then blesses the crowns, which are placed on their heads. The crowns have two meanings: First, the couple have come into the Kingdom of God and taken their place as a king and queen in their marital kingdom. Secondly, the couple bears witness to Christ’s presence in their lives. The ribbon joining the crowns represents the unity of the couple. The crowns are exchanged three times to signify the sealing of the complete union. The bride and groom drink from a common cup to signify the sharing of their lives together—their joys and their sorrows. The Dance of Isaiah is a procession led by the priest as he places his hands on the joined hands of the bride and groom. They process three times around a table on which the cross and the Gospel book are placed, as a reminder that they must keep Christ at the center of the marriage. The hymns sung during the Dance of Isaiah recall the themes of blessing, and the setting apart of the couple from this world to a union with Christ. The best man and maid of honor follow the bride and groom as witnesses, and pledge lifelong moral and spiritual support. The Priest removes the crowns and places them on the Gospel book as an offering of the marriage to the Lord. The priest prays that God will receive these crowns into His Kingdom. The couple now begin their journey together in Christ at the foot of His altar. The Epistle reading, Ephesians 5:20–33, explains the mystery and holiness of marriage, as well as the duties and responsibilities of a husband and wife. The Gospel reading, St. John 2:1–11, retells the story of the wedding at Cana, where Christ blessed marriage by turning the water into wine, symbolizing the turning of our passions into virtues. 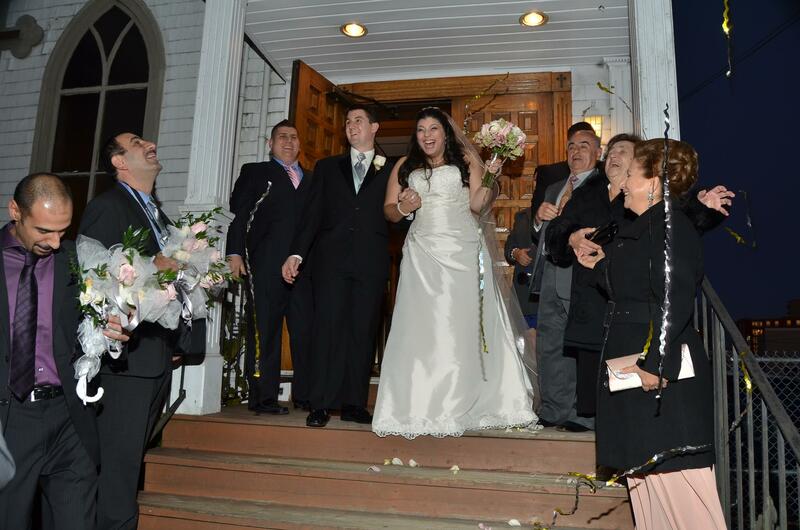 Complete the online application form ( http://saintantonios.ca/formwedding.html ). The marriage reception can occur at the Church Hall or the Olympic Hall if desired. A complete list of businesses associated with Church members who provide professional services for such events is forthcoming, and we apologize for having omitted anyone (please email us if you would like to be included).